A blog about skiing, snowboarding, wintersports, ski and snowboard gear, ski resorts, ski industry trends and winter tourism. It's also the start of the second weekend of World Cup racing at Louise, so a good reason to get up there soon. And the second reason: the early season snow is incredible. My great ski friend - Scottish but lives in Calgary/Canmore - has already been out and she usually doesn't don skis until December! She says it is fantastic! Her exact words were: "Managed to get my first day's skiing in at LL on Sunday - it was fantastic! We ended up doing a full days skiing with no lift lines and great snow so I was exhausted after and my legs really know that they've been skiing again." Lake Louise also got ranked really high in various top publications: one of the top-10 Ski Resorts in North America by Outside Online, one of the top-20 Ski Resorts in North America by Condé Nast Traveler (only two resorts in Canada made the list) and one of the top-10 gadget-free vacations in the world (Skoki Lodge), by Sun Media (who incidentally I used to write Snow Scene for in the Calgary Sun - check out my archives there by going to http://www.calgarysun.com/sports/snowscene/2009/12/03/12019041-sun.html. So, get out there and enjoy it and think of me typing away about skiing but thousands of miles away from the slopes! You don't have to feel too sorry for me though as I will be back in the Rockies in a couple of weeks time. Amazing News! For the second time in history, Delirium Dive at Sunshine is opening early - in fact today, so a great USA Thanksgiving gift to us all. Even though I am way down south in Columbia, South Carolina, it is great news for me as I am coming to the Canadian Rockies on December 15. If there is that much snow at Sunshine right now then it augurs well for my two-week trip!! Last time I skied Delirium was a gorgeous sunny day. I was with my husband, my younger son and his friend, in the company of a few guides and a photographer from SKI Magazine. You can see the photos in the Jan 2012 edition of the mag although only the two lads made it into the published pictures. I'm so excited that resorts all over Alberta and BC are notching up early openings due to the substantial snowpack in Canada. Lake Louise is wide open already and Mt Norquay and Nakiska have been operating since Halloween. 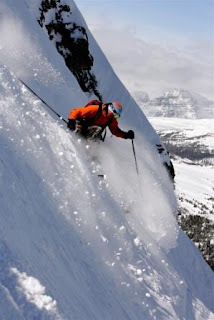 With five newspaper writing assignments, I will be skiing Lake Louise, Sunshine, Mt Norquay, Kimberley, Kicking Horse and Panorama this December. My advice to everyone: get out on the slopes before the Boxing Day rush. You can sometimes get the best skiing of the entire season in the quiet lead up to Christmas while everyone else is out doing their holiday shopping. I call it Sandy's Silver Lining. But then, I also cheer when it starts snowing and other people are bemoaning the fact that they have to clear their driveways! Even though I'm still sunbathing by the pool in South Carolina, I am thinking "Roll on December" when I will be returning to Canada for 17 days. I would normally ski all of those days (except for Christmas Day) but this season I will be taking it a bit easy due to recent knee surgery. The silver lining of that cloud is that I will also get the chance to experience the spa side of ski resorts and be able to launch into après with abandon - maybe not the table-top dancing though. With tentative trips planned to Lake Louise, Banff Mt Norquay, Sunshine, Kimberley, Fernie, Kicking Horse, Sun Peaks and possibly Revelstoke, it will also be a great opportunity for me to reacquaint myself with the groomers, intermediate glades and more gentle areas of each ski hill, enabling me to write more accurately about these for assignments in The Dallas Morning News and the Calgary Herald and, of course, in One, Two, Ski! Meanwhile, do check out TDMN and Calgary's Child Magazine for my ski articles over the next few weeks. Keep checking this blog for new publications and new posts and don't be afraid to post your comments and suggestions. And please send the link to all your friends who ski/snowboard or those who don't. You never know who you might be able to persuade to ski or snowboard and start really enjoying their winters!